Pixar’s first foray into storytelling with a female protagonist ended up being funny, enchanting, and wholly satisfying. If you didn’t catch Merida, the fiery redheaded heroine in Brave, when she made her debut in theaters, you won’t have long to wait. 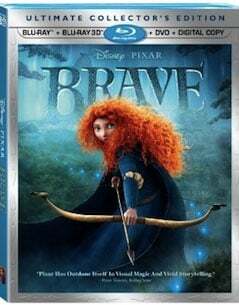 Disney•Pixar is bringing Brave to Blu-ray and DVD with plenty of time before the holidays, releasing the title on November 13. While the Scottish tale of a young woman figuring out her destiny and learning about her family along the way is pretty awesome, I’m almost more excited about owning the Pixar short, “La Luna”--which follows the three caretakers of the moon as they go about their business--than I am about owning the film itself. If you are planning on buying a copy, Disney is offering several different sets for fans to choose from that range in price from reasonable to expensive. Disney’s usually pretty good about giving fans options for sets, but if you want all of the potential bonus features, you may want to spring for the the 5-Disc Ultimate Collector’s Edition, which will offer commentary, several film shorts, a multitude of featurettes, and even some interactive features. Honestly, if you don’t have 3D capabilities it will probably just be better to roll with the Collector’s Edition: 3-Disc Blu-Ray Combo Pack, which will feature all of the Blu-Ray extras, but not the 3D short. If you don’t care about most of the extras, Brave will also be offered in a 1-Disc DVD that’s bound to save you money.